Review of my day at the Who Do You Think You Are? 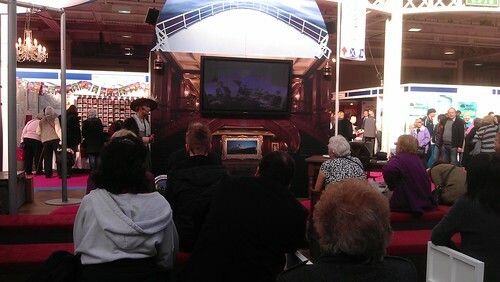 Live 2012 (WDYTYA Live) show at Olympia, London – including my top tips for you and for the WDYTYA Live organisers! Back for my second and consecutive WDYTYA? Live show in Olympia, London. 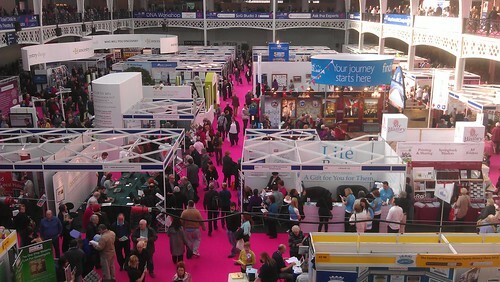 Day 2 (25th Feb 2012) – it’s impossible to take a photo that shows the full scale of WDYTYA Live. Last year I was able to catch the entertaining Monty Don, who talked about his experiences of filming his episode and the effect that it had on him. Unfortunately I missed this year’s Emilia Fox, whose episode was heart-wrenching and fascinating. Instead, I had pre-booked myself on to a couple of talks – the first being a keynote workshop organised by the Society of Genealogists and hosted by the brilliantly raconteur (and freshly outed event tweeter) Else Churchill. The topic of the workshop was “Breaking the barriers of Social Networking – Strategies and Tricks”. By name, it made me quite excited to attend to see if there is anything that I could use in my own research. The session was led by Laurence Harris from MyHeritage, and whilst interesting, it did stray away from social networking – even touching on DNA testing – and did feel a little at times like a product pitch by MyHeritage. However, there were some good ideas at using social media, and Laurence was clear in his descriptions of the benefits, disadvantages and concerns over using social networks and other online platforms as tools for research. He even introduced me to Mocavo – a genealogy-savvy search tool (and kudos to Mocavo for tweeting at me in response to my tweet about them). This was followed by a Q&A session with a panel of experts who were certainly from quite a wide range of backgrounds – including D. Joshua Taylor from BrightSolid.com (the partners that help deliver FindMyPast), and Lisa Louise Cook (Genealogy Gems, Google expert). Else Churchill (far left) introducing the panel of the Keynote Workshop: ‘Breaking The Barriers with Social Networking – Strategies and Tricks’. This year, I was also fortunate to meet the brilliant geneageek Lisa Louise Cook after she literally wowed the audience as they frantically scribbled notes during her talk ‘Google Search Strategies for the Family Historian’. What she doesn’t know about using the family of Google products for genealogy research just isn’t worth knowing. She introduced the audience to ‘search operators’ and how to wield these to make Google search work its hardest for you. I’d never heard of ‘synonym search’ or using a date range tool in my search box, but I know that I will be doing this from now on. If you’ve never heard of Lisa before, check out her free podcasts on iTunes! FindMyPast might be bigger, but Family History Societies are equally essential in your research. It’s important to remember the hard work that societies do for genealogy – it’s not all down to the big names like Ancestry, FindMyPast or GenesReunited. Who Do You Think You Are? Live gives huge exposure to a vast number of these local societies and I was very pleased to finally meet Carol Noble from the Cambridgeshire Family History Society, who was very helpful and great to talk to – I’ll be keeping my eyes peeled for records for her from now on! I was also pleased to see the Suffolk Family History Society there too, who gave me some inside news about the availability of some more records from Elveden. Lots of other counties were also present – Norfolk’s stand was crawling with people eagerly browsing their books and cd-roms. I was a little bit disappointed to see that the Somerset and Dorset Family History Society didn’t appear to have (unless I totally missed it) anything to buy and take away – ideally I’d love to get my hands on a cd-rom of parish register transcriptions in the style of the CFHS or Suffolk Family History Society – but instead, they were offering look-ups on their computer for £2 each. More chairs needed up in the gallery area! 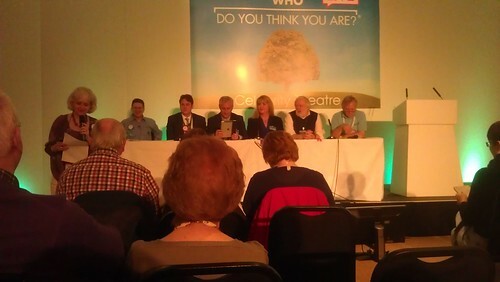 Set up a ‘tweet-up’ lounge space for genealogy twitter chums to meet up in *yikes* real life (!) and talk genealogy social media and tech! Encourage the Local History societies to put their region name up on the top boards of their stands in big letters – takes ages to track down the county you want! Nick Barratt with film crew in tow; the legend that is Eric Knowles valuing heirlooms; a man with an incredible moustache; and author Chris Paton wearing a rosette. What a shame they only hold this in London. There are so many great venues that would have better facilities, easier access and cheaper places to stay.